But, considering that this was my first time out as a TDF Knit alonger-er, I got a whole lotta Meramid to show for the past three weeks! Keep in mind there is also a completed sleeve, and that I finished about half the right front on the plane on the way home from Michigan today. 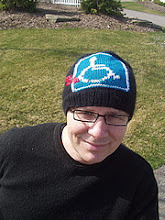 You can go see the work of all the committed knitters on the Tour KAL blog. Here's my Dud holding the garment as it was last night. Finishing it is within my grasp. And I love it; it has been worth every stitch. One problem with bringing this to Michigan? 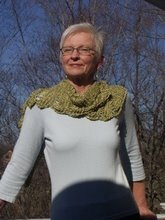 My mom began to speak at length about how she loved it and how flattering it would be on her. And I agree. But that's a LOT of knitting. First, I present an exactly halfway done Mermaid! I'm not sure if I'll fall off the back of the peloton, but I have high hopes for a dramatic finish! But on to yesterday's encounter. On our way home from our Nashoba Valley (ready: HILLY) bike ride, Chris and I passed the following sight. We stopped, and I jumped out to take photos and ask some questions. I mean, wouldn't you want to ask some questions? 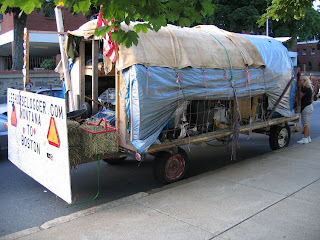 This is a homemade cart made by Lee Horselogger. 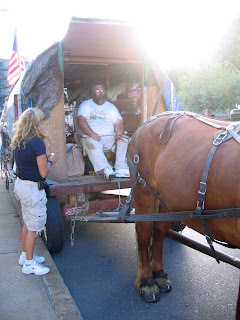 He has driven this cart, pulled by two hard-working but unfriendly horses, from Montana to Boston. Seriously. See his website. It's just one hermetic man from Montana and his dream. Here he is: This photo doesn't do him justice; the sun was behind him. See his site. Seriously. 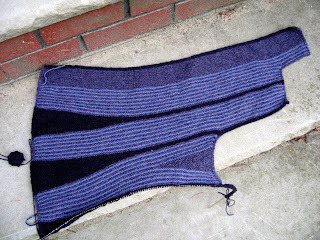 After considering abandoning Mermaid for a while in favor of making a Tomten jacket for a baby shower that's fast approaching (yes, it will be another Doughy Dutch Baby, but this time I know it will be a boy). However, Chris gave me a pep talk ("NO! You are NOT giving up! I don't want to hear this kind of talk!" and so on), and I picked it right back up. Here it is! I'm to the point I was before ripping, but this time it's correct. Correct is good. On Wednesday, on my new Armadillo tires, I DID make it to Target and purchased the dress. So Wednesday was a sort of Tuesday do-over, with GREAT SUCCESS!!! One more thing: on the rest day I finished these adorable little guys. They're sized for a 6-month-old, and are going to a friend of my mom's who just had a baby. 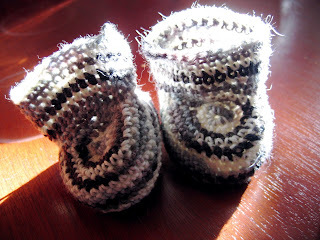 Like the infant-sized black-grey-white booties I posted a bit ago, these are make from a free pattern at pimpampum's blog. Go see her site; she's quite an artist. So yesterday I went on a bike ride, intending to go to Target and get this dress. However, on the way, I rode over some metal shard shed by a passing car. My tire was lacerated and went flat in about 2 seconds. Which meant a quick trip to the bike store for new PUNCTURE RESISTANT tires. I believe they're called "armadillos," but I was too bummed to really pay attention. Why so bummed? On the drive to the bike store, I noticed that my Mermaid had a HUGE mistake about three inches from the beginning of the body. And yeah, since the last photos I had done a lot more. The body was kinda like half way done. Now it's about 3 inches done. Yes, that's the left front of Mermaid ON A BIKE! And I'm on my NEW Trek 1000 road bike! Making the shift from basic city/hybrid to road bike is like magic. I feel so fast and comfortable with rolling terrain. Though I didn't give much credence to the idea of the "women's bikes," once I rode this one, which IS a women's model, and then rode the step-up model, which only comes in a men's frame, I was THRILLED at how the women's model worked with my build. 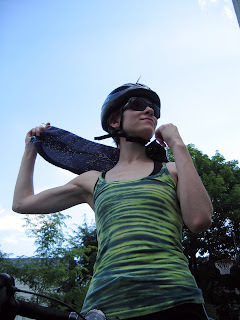 In particular, the handlebars are narrower, meaning that my arms stay closer to my body as I ride. It's SO comfotable. I do feel like a superhero! Here I demonstrate how LIGHT my new bike is. 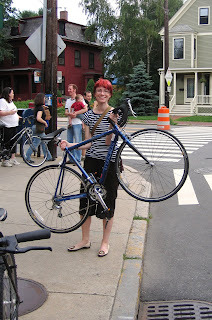 This is right outside Ace Wheelworks, where I purchased it, and it's cool to see the people behind me, who were also looking at bikes. Notes on Mermaid: the body is constructed from side to side, from left front to right front, in one piece. You can see one taking shape well at Arja's blog. 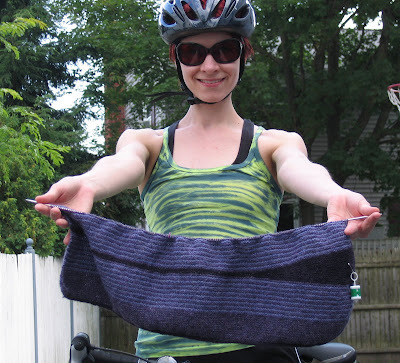 She's also knitting at hers during the Tour (but she seems distracted by socks and actual bike riding! I can't criticize her, though... she's a lot further on her Mermaid that I am!). I don't find the pattern to be very difficult; the directions are terse but clear. 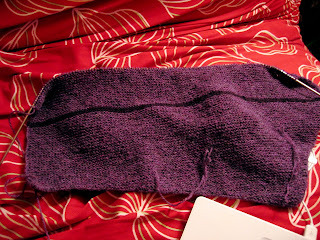 Though it's all garter stitch, this is not a beginner's project. 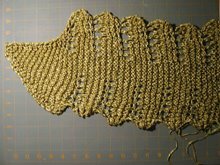 It requires a good understanding of shaping, short rows, and edgings; also, it's just really, really time consuming. 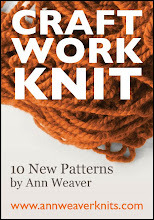 So, in sum, I think the pattern is ingenious, lovely, well-written, but daunting due to size and detail. 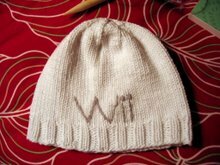 Nice for someone with good basic skills who's a pretty fast knitter and is willing to put the time in. Time to get back to the knitting! Follow the Tour de France and the intrepid knitters challenging themselves over these three weeks HERE. Mermaid is coming along well: here I am, in full Green Jersey mode, modeling one completed sleeve while knitting away on the body. I've just arrived home; today's stage is being replayed (hooray! ); I have a beer; knitting is in hand. Tour de France Knitalong and... BIKEDAY! Oh yeah, that's about 2/3 of a sleeve! Will I finish by July 29th? WHO KNOWS? 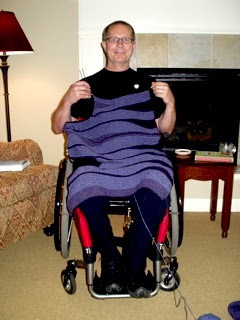 I do know that Chris and I will be faithfully watching the Tour every day, and that, with his encouragement, I will knit like crazy not only during that time but also while commuting, at lunch, whenever I can. I must be HUNGRY for this victory, for it is indeed a sprint! 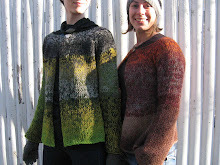 Check out the Knitalong, and a lot of information on the Tour riders and progress here. Which puts me in the Green Jersey (Mailot Vert) cagetory. Whew! I have done a bit of distance running, and more and more biking, but I was certainly never a sprinter! I can experience this new identity through my knitting. Additionally, due to some extra unexpected income, I will be getting a NEW BIKE this coming Friday. Nothing too fancy, but it will be my first real road bike. Last summer Chris, who's been into cycling for some time, and I began to take longer rides together, anywhere from 10 to 40 miles. While my hybrid, city-commuter type bike is manageable, it slows me down a lot and makes the experience less fun for Chris and myself. I'm not looking to be a super biker, just to be able to ride farther and faster more comfortably. I don't believe in spending a lot on gear until I'm sure that the gear will get a lot of use, but I'm confident about this purchase. Photos to come soon!!! So I got a package in the mail yesterday from Elinor! When she realized that her socks were pooling a way that didn't really suit her, I volunteered to trade a nice skein of my sock yarn for her socks. She received a skein of deep purple Sea Wool, and I received THESE!!! 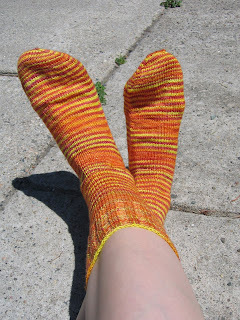 They're made of Woolarina sock yarn in the "Grapefruit" color, and are JUST my style and a perfect fit. I can't wait to wear them to work! Thanks, Elinor! 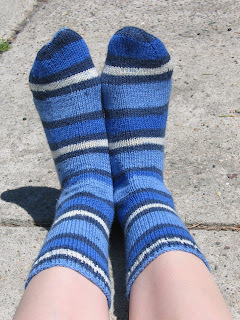 Moving on to some finished objects, here's a pair of socks started in January that I finally finished up. 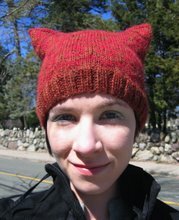 They're made of Froeliche Maxi-Ringel, and if anyone could tell me if there's any place in the USA from which I could order this yarn that would be fantastic. I love it, despite its lack of sproing and softeness, especially compared to the Woolarina. Oh, and these are for ME. That's TWO pairs for me! And one more pair: These are for the Christmas Present stash, for someone who will just have to wait. They're made from some Meilenweit I got in Germany; the pattern, I believe, is named "Fun." After completing these, I thought, "yeah, that is Fun." Why all this finishing? Well, I've joined the Tour de France Knitalong, and will ONLY be working on my Hanne Falkenburg Mermaid until the tour is over. So expect lots of pictures of garter stitch. My goal is to finish it, but even if I don't, the dent I make will make getting it done before fall manageable. Would I rather be working on some original designs or making more baby booties? Well, yeah, but I REALLY want to wear Mermaid, and I'm gonna!!! Things are happening. At a rapid pace, too! Our browser has been down, seriously limiting my posting ability. Here is what has transpired at Haus Weaver Bergh lately. 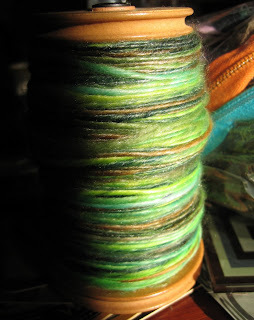 I used the long-draw method and attained what seems to be a very even sportweight yarn. 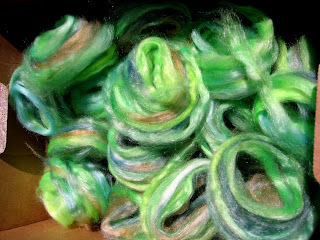 I only recently dusted off my spinning wheel, and look forward to some handspun/handknit creations in the near future. There was also a trip to Savers, aka Value Village. WOW. 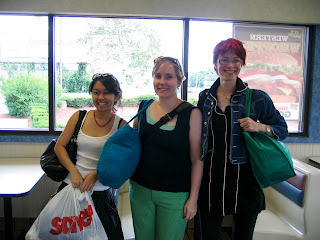 I went with my friends Hannah and Jenny; here we are at Burger King after our shopping spree. I asked a nice man to take our photo. Oh, all those bags we're carrying were empty when we rode the bus to Savers. 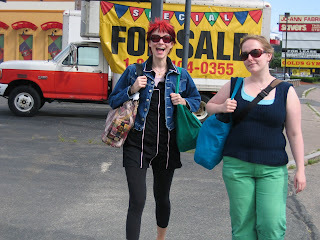 We walked back to the West Roxbury bus after another stop at Joanne's fabrics, where I purchased fabric for a trapeze dress I plan to sew this weekend. 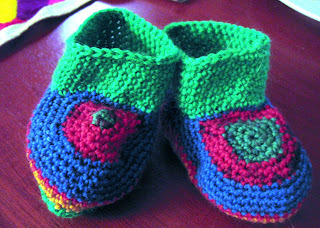 I also crocheted baby booties for my upcoming whatever-you-call-it when your cousin's wife has a baby. 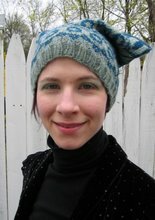 The pattern is found here, on pimpampum's amazing website. I sized these down, since the first one I made according to her pattern looked like it would fit a 10 year old. Whew! There's more, too, but I have to keep some for later!